The LG brand name stands for "life's good" and who can argue when you see the W1953T-PF? This 18.5” LCD monitor meets or beats the standards set by its competition. The first thing that stands out is the brilliant 50,000:1 contrast ratio and 300cd/m2 brightness this monster of a monitor provides. Plus, The 170 degree (H) and 160 degree (V) viewing angle is backed up with an anti-glare screen to make viewing enjoyable from just about any angle in any lighting. With the LG Smart Monitor’s Auto Bright function, the W1953T-PF monitor automatically analyzes the brightness of ambient light and data source, and then sets the optimal brightness to make your eyes comfortable. The Live Sensor feature saves energy and extends the monitor’s life; Time Control reminds you when it’s time to take a break to avoid eye strain; and the Cinema mode lets you view film on the monitor just like you would in a movie theater. For the gamers and video editors out there, the blazing response time will keep blurring and ghosting to a negligible minimum. 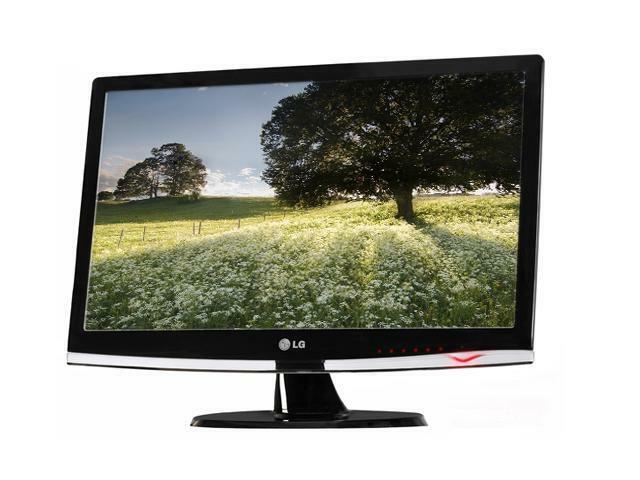 It's insane for us to offer such a high quality LCD monitor at such a value! Quick, take advantage of this deal! Ultra-High Dynamic Contrast Ratio The LG W1953T-PF's impressive 50,000:1 dynamic contrast ratio and 300cd/m2 brightness ensure accurate color reproduction and sharp images even when displaying darker scenes and images, for breathtaking games and full-motion video! Fast Response Time The LG W1953T-PF's fast 2ms (GTG) response time ensures speedy color switching for enhanced motion video and gaming performance. Auto Bright Sensor The LG’s Smart Monitor’s Auto Bright function automatically analyzes ambient light and data source with a Bright Sensor, and then sets the optimal brightness to deliver a clear image without causing eye strain. Live Sensor The Live Sensor allows the monitor to automatically turn on when it recognizes a users’ hands approaching it. This function saves energy and extends the product life. Smart Package: Auto Bright, Cinema Mode, Time Control, Live Sensor. 17.8" x 14.1" x 7.2"
Other Thoughts: For the money, a 2ms response screen with a decent contrast such as this makes for a great display. Sure, its not a 19-22" screen, but I don't care to turn my head to scan the screen. The monitor's low cost makes it ideal for a budget build and combined with its specifics (quick response, high contrast, and moderate resolution) it is perfect for the budget gamer. Pros: Great screen! Really clear picture and great response time... best you'll get for the price! I'm sure this is just a manufacture defect. Cons: Color is not uniform from top to bottom, depends greatly on angle of viewing. Movies look pretty bad and it's tough to design in photoshop when the same color looks different at the top of your monitor and the middle. On/off button feels cheap and often doesn't respond until repeated attempts. Other Thoughts: I bought two of these, one of which had a single dead pixel, but not even sure if it's still there -- one dead pixel isn't noticeable in day to day use. Maybe I'm used to higher quality monitors, but these have noticeable color variations throughout the screen and the edges have a large amount of extra brightness, which completely washes out dark scenes in movies and causes color variations on one edge no matter which angle I put the monitor at. Pretty disappointed with my purchase on this one, but that will teach me to not go cheaper on monitors in the future. Pros: Very crisp resolution, looks HD to me. The touch are pretty cool but get a little annoying(see cons) But pretty good for the price. Cons: Finger prints a very noticable, and the touch buttons will mess up a little. They dont respond somtimes. The menu is a little confusing. Other Thoughts: Overall, very good monitor for the price, would be nice it it came with a DVI cable but as long it comes with VGA im happy. Pros: Sleek design that fits well even on a small desk. Resolution is average but also adequate for my needs. Picture color is intense and vibrant. Cons: The stand is a little wobbly so be careful when pressing buttons or moving it otherwise good. Pros: Clear w/ fast response time. Cons: The actual resolution of this thing is 1360x768 not 1366x768. That needs to be corrected. Was one of the reasons for my purchase. At the correct resolution, I can clone to my hdtv, but alas, newegg hoses me. Other Thoughts: Should come with hdmi chord standard/not an additional purchase. But I already knew that. Pros: Very nice looking, pretty big ( i was using a 15") i like the little red light, great picture, my games look clear (easier to see enemy in fps games), 2 ms! Other Thoughts: I like it.